Anyone who loves to read will appreciate Jefferson's sentiment. Written in script is Jefferson's famous quote, "I cannot live without books." 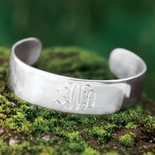 This cuff style bracelet is handmade of sterling silver and adjusts to fit most wrists. Made in the U.S.A. 2 1/2" wide. Gift boxed.